KUALA LUMPUR, 24 May 2012 – Doctors, legal practitioners, the police and representatives of insurance companies met in a seminar at The National University of Malaysia Medical Centre (UKMMC) in Cheras here today to look at how they can expediate payment of compensations to patients arising from accidents and negligence. The Medico Legal Seminar, organised by the Health Information Department of UKMMC brought together all stakeholders to understand their roles when a medical case becomes a legal issue. 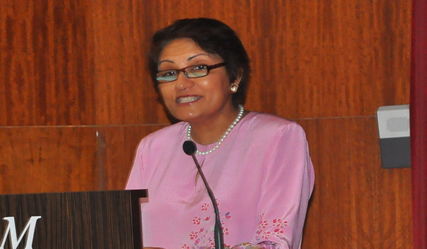 Deputy Vice Chancellor (Industry and Community Partnership), Prof Dato’ Saran Kaur Gill who officiated the seminar said there was a need for all parties involved in such a situation to strengthen cooperation for the benefit of the public. The multi profession engagement is hoped to benefit patients by reducing the time taken for them to receive compensations by avoiding unnecessary delays. “Patients hospitalised following accidents just want less heartaches and hassles in their quest for justifiable compensations but were forced into bureaucratic procedures,” she said. One of the common scenarios was where a patient who deserves compensation had to wait for years because of the many parties involved. That waiting period could be reduced if everyone involved knows what is required of them. A court before deciding on the quantum of compensation to be paid would need expert evidence to decipher medical reports and those giving expert advice could help speed up the process if they knew exactly what was needed. If a medical report is late, it adds up to the time. And when an expert witness fails to give an objective advice then that is going to be reflected in the outcome of the case. The needs and interests of all parties involved must be addressed, Prof Saran said. The Police personnel investigating the claim, the lawyer, the manager of the compensation and claims department at the insurance companies, and the doctors; not everyone can fully appreciate the trials and tribulations as well as the stresses and strains they undergo. The seminar attracted over 400 participants from various fields to gain understanding of how the legal system works in relation to medical service. It covers topic such as consent and confidentiality, medical reports, understanding Police work and medical claims. Present at the seminar was Deputy Dean (Clinical Services) of UKM Medical Faculty, Prof Dr Jaafar Md Zain; Deputy Inspector General of Police, Tan Sri Dato Sri Khalid Abu Bakar and Associate Prof Dr Saperi Sulong Chairman of the organising committee.